I envy my cousin Paula. Her two cats — named Louis and Ella, after Louis Armstrong and Ella Fitzgerald — pose beautifully for pictures (or at least she manages to get them to stop long enough to GET pictures). Me…? I have one cat — Ciara — who never, ever stops moving unless she’s on my lap, which is not exactly the best place for me to get a picture of them. 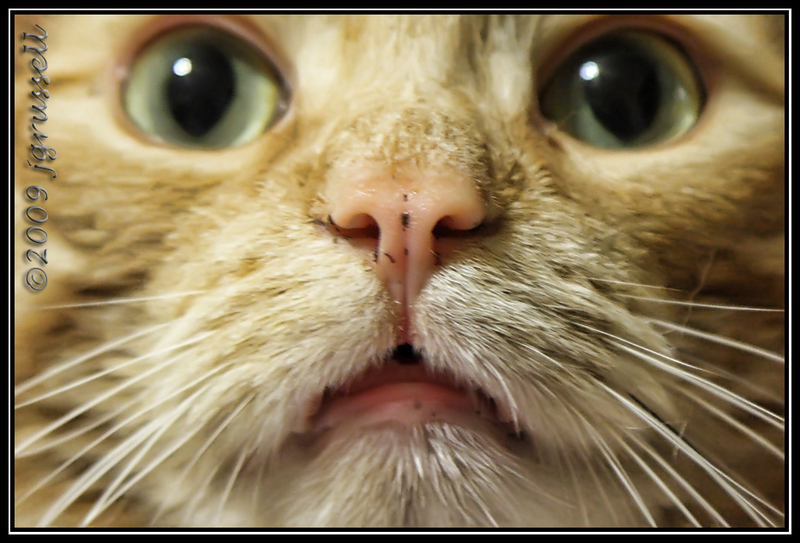 And the other one, Clancy… well, whenever I pick up the camera, he’s just plain NOSY! This entry was posted on Thursday, August 6th, 2009 at 11:23 pm and is filed under Photography. You can follow any responses to this entry through the RSS 2.0 feed. Both comments and pings are currently closed. Aww… Louis does that sometimes! Especially with the P&S – he’s GOT to play with the camera strap! Donna’s kitties are more sedentary than mine. But mine do pose well. Some of the time anyway.